A wonderful program about the history of Leonard-Leota Park in Evansville fascinated—and stumped—park fans at an outdoor event Sunday, August 27, 2017. Former state architect Dan Stephans was one of two featured speakers. He created a pause among the audience, wondering where any information could be found regarding the naming of Lake Leota. To date, no verified story has emerged. Levi Leonard, an Evansville pioneer, sold some of his land to the city in 1883 to create what is known as the “upper park.” A prominent citizen, Leonard was the first teacher in the community, yet described himself as a capitalist on the 1900 U.S. Federal Census. In 1922, the city acquired the “lower park,” which increased the size of the park to include the lake area. However, it was the WPA projects during the 1930s that contributed not only to the park’s special appeal, but eventually to its inclusion on the National Register of Historic Places in January 2011. Tim Heggland, the second speaker at the Sunday program, is an historic preservation consultant. He wrote the nomination to place the park on the National Register. In it, he cited the extensive stonework, which was key to numerous projects. The Historic District includes 29 contributing buildings, site, structures, and objects and 11 noncontributing buildings and structures. Stonework required hand labor, which meant many individuals could find employment with the WPA. At the park, stone was used for rip-rapping the creek bed, plus creating stone tables and benches, a warming house, park store, duck house, beehive fireplace, and bell tower among many features. A later feature of the park, also notable, is the unique twin spillways straddled by a pedestrian bridge. One more activity was the opportunity to handle a WWI soldier’s field kit. The replica kit was loaned from the Wisconsin Veterans Museum, in part to recognize the 100th anniversary of the U.S. entry into WWI. It was a hit with the younger audience members. They were curious and willing to try on the gas mask, helmet and jacket. During the “History in the Park” event, the museum was open extra hours. Special exhibits focused on the early supporters and structures in the park. The Antes Cabin also was open. It was one of the original tourist cabins at the park, and later used by Scouts among others. It is in need of further restoration, says Jennifer Ehle, president of The Grove Society, which sponsored the History in the Park event. The society is Evansville’s local historical society. Another activity included a walking tour of the Grove Street Historic District, led by John Decker, former president of the Evansville Grove Society and current director of the Wisconsin Council for Local History. Stories and memories were submitted by local citizens about their remembrances of the park. They were collected by the local historical society and rewarded with ice cream cups by the local Piggly Wiggly grocery store. Steve Lentz won a gift certificate from the Main Street Café. Ehle invited the crowd to share ideas for future programs. Ideas can be sent to jenniferehle1@gmail.com. Anyone—particularly woodworkers—interested in the cabin restoration project are also invited to contact Ehle. Architect and historian Dan Stephans takes the microphone. Older sister Regan, with twin siblings Carsen and Corbin, took an active interest in the replica field kit carried by a WWI soldier. 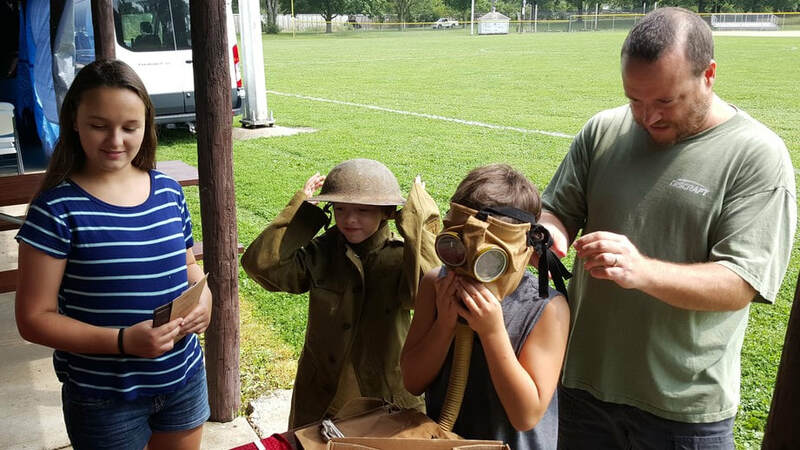 Dad Matt Hoffman adjusts the gas mask on Corbin..
Speaker Tim Heggland describes features of Leonard-Leota Park that specifically contributed to its noteworthy placement on the National Register of Historic Places.